Jinn (João Victor Gonçalves Costa) is a 21 year old computer graphics student from São Paulo, Brazil who joined Pixeljoint in August 2008. He is a book editor by day and a pixel artist in his free time; he began drawing on paper from early childhood, eventually migrating to digital drawing and pixel pushing. Thanks so much to all who took the time to vote and participate in the challenge! Check out the Zarblay Xemplok forum thread for more information. It's time to vote for the latest pixel art challenge: A City in the Clouds. Much like the Mid-Canvas Void challenge we ran a while back, the goal here is to pixel something using the provided template. You must, however, include a single solid coloured area - indicated below by the highlighted green square. The highlighted section can be any colour you want; it doesn't necessarily have to be #00ff00 / green. You may rotate the canvas if you like; this means that the top, right, bottom, or left hand side could contain your solid-colour area. Perhaps, most importantly, unlike the previous challenge, your image doesn't have to relate to fruit (but it can if you want). Colours - Unrestricted. Keep in mind though, that your chosen side canvas section must only be one solid colour. New member Mike Scott (mikdog) recruited several PJ members for an 8bit pixel animated music video collaboration. Just featured in Kotaku... Pixeljoint gets credited too! Indie game developer and artist albertov (winner of this month's 4th place pixel) has just released Mosquito's Insomnia for the iPhone and iPod Touch featuring beautiful 100% pixel art graphics showcasing his unique style and original color palettes. Thanks so much to all who took the time to vote and participate in the challenge! Check out the It's Horrifying! forum thread for more information. It's time to vote for the latest pixel art challenge: Zarblay Xemplok. Show us a scene depicting an original city that resides on or just above the clouds. Canvas Size - Max 175 x 225 (either horizontal or vertical). A new tower climbing platformer has been released to promote the fast-approaching theatrical release of The Hangover Part II in US theaters on May 26. The environments are NPA, but the character and object sprite animations feature pixel goodness by one of PixelJoint's own, StickyTape (aka Argyle). April was a month dominated by characters in scenery. Many thanks go out to this month's top pixel artists and all the members who took time to rate. The Cap socks Hitler! by The B.O.B. You may present the character in any way you want, from a facial portrait to a full body image. But whatever you choose, Zarblay must be the main focus of the piece. Your piece must also show all three physical characteristics listed above. Optional Bonus Challenge: Use real ZX spectrum restrictions. Have a look at this guide, created by Ptoing. Canvas Size - Max 256 (width) x 192 (height). Thanks so much to all who took the time to vote and participate in the challenge! Check out the The United Cakedom forum thread for more information. It's time to vote for the latest pixel art challenge: It's Horrifying!. Japanese designer Kunihiko Morinaga showcases an 8-bit interpretation of the range of women's fashion, from dresses and professional suits to athletic styles and sweatshirts, in the pixel-patterned fall/winter 2011/2012 collection of his fashion company anrealage. The line debuted during Japan Fashion Week. Pixel Art Challenge: It's Horrifying! Your challenge this week is brought to you by Delicious. He wants you to create a mock-up of a horror video game! Your mock-up must at least include a central character (the player) and a HUD. Also, the environment should be some-what gloomy, but it's not required, as long as there is something in the mockup that could categorize it as a horror game. Check out here, here and here for some ideas. Canvas size - Unrestricted (Single Screen) Multiple Screens for same game allowed. 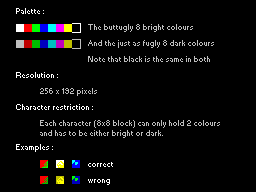 RULE EDIT: for those making multiple screens and want space between screens using trans color is ok for a total of 26. It's time to vote for the latest pixel art challenge: The United Cakedom. Thanks so much to all who took the time to vote and participate in the challenge! Check out the Easter Clusters forum thread for more information. There was probably some kind of notable wedding recently, who knows. Just in case there was, we should bake some cakes to celebrate, well, actually, how about we pixel some cakes instead? Just so we're clear, no backgrounds; just the cake on its own, served on a transparent background. For some cake ideas, check here; also, here's a whole bunch of delicious examples from the gallery from emlan. Canvas size- Max 72 x 72. Thanks so much to all who took the time to vote and participate in the challenge! Check out the Noise Inhaler forum thread for more information. It's time to vote for the latest pixel art challenge: Easter Clusters.